The details of the agreement are expected to be announced later. "For thousands of years, the Nile water has been flowing with God's order," El-Sisi told hundreds of Nile Basin delegates who gathered in the Sudanese capital of Khartoum for the announcement of a deal. "We could cooperate and accomplish great things or disagree and hurt each other…we have chosen to cooperate," El-Sisi told the audience to strong applause. Speaking ahead of Egypt's president, Ethiopia's Prime Minister Hailemariam Desalegan stressed that the Renaissance dam his country has been building to generate electricity for economic development projects would not cause any harm to the Egyptian people. 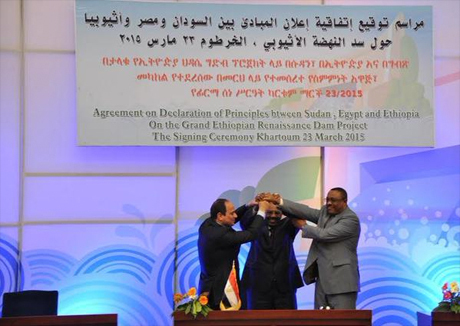 "Egypt and the rest of the Nile Basin countries are "one family," Desalegan said. "We covered a big step forward by reaching the declaration of principles," Desalegan said. Ethiopia chose to take the "collaborative path" on the issue of distribution of the Nile water, he added. Speaking last, Sudan's President Omar Al-Bashir stressed on the importance of cooperation to fulfill the development goals of the people of the region. "You are embarking on an historic move… we have taken praiseworthy steps to reinforce and support trust and inter-connectedness between our peoples," he said. Al-Bashir said that the declaration of principles signed by the three countries will be observed by all three, adding that the road has been paved for further talks among all Nile Basin countries to reach a broader agreement. Egypt's President El-Sisi had arrived in Khartoum on Monday for eleventh hour talks with Sudan and Ethiopia as the three countries prepare to sign a tripartite agreement on Addis Ababa's giant Nile dam project. The three countries have agreed on commissioning an international firm to conduct studies on the impact of the construction of the Ethiopian dam on water flow levels to downstream countries. In his remarks on Monday, El-Sisi stressed a final agreement would be signed after studies on the dam's impact have been completed. On Tuesday, El-Sisi will head to Addis Ababa to conduct bi-lateral talks with Ethiopian authorities. The Egyptian president is expected to ask the Ethiopian parliament to issue a formal recognition of Egypt's rights to its share in the Nile water in excgange for Cairo backing Addis Ababa's economic development project. Egyptian officials had said any potential deal on sharing the Nile waters and operating Ethiopia's contested dam, would be binding on the three signatory states. Egyptian Irrigation Minister Hossam Moghazy stressed any agreement would oblige Ethiopia to amend the dam's specifications if consultancy studies on the hydroelectric project if the project proves it could harm downstream countries. For several years, Egypt has raised fears Ethiopia's under-construction $4.2 billion Grand Renaissance Dam would negatively affect its Nile water share. The Ethiopian 6,000 megawatt dam, set to be Africa's largest, is expected to be fully completed by 2017. Ethiopia has finished constructing at least 40 percent of the dam. I like turkey's appraoch. We do what ever we want with our water and you do what ever you want with your oil. Ethiopia should n't compromise. Infact additional plan should come into play. the water should also diverte to Tgray province and create a green paradise there. There is a drawing for that that the Italians created. Ethiopia should use the money generated by GERD should be strong enough to defend itself and its resource. "not any significant harm to Egypt"
Lots of respect for El-Sisi for his extraordinary visionary leadership towards a new bright future for all the nations involved! The president said Egypt chose cooperation over years of damaging animosity, and we can't commend him enough! God bless! Now, Ethiopia is open for business for our Egyptian brothers and sisters! Egypt might have historic right. But Ethiopia has NATURAL RIGHT. 85% of Nile belongs to Ethiopia!!! We will benefit a lot from this together. This is a historical day not only between the three nations that have very old and ancient common history together but also for the whole of Africa. No one looses here but all of them are winning particularly Egypt. The flow of the Nile water to Egypt is totally guaranteed throughout the year for forever. Dams in Ethiopia will not decrease the water flow to Egypt but increases knowing Ethiopia has no desire for irrigation and the water evaporation on the Highland is very low comparing in Sudan and Egypt. President SISI is great. He knows the nature of the Habesha people what they look like for real including During Prophet Mohamed difficult time in the Arabia. Ethiopians will never ever even think harming Egypt for any reason let alone with water that is the life line to all living things. Congratulates to the leaders of the three nations and citizens. As Stratfor analysis showed, Egypt was FORCED to sign the agreement by all-too-wise and roaring source of the Nile - Ethiopia. Time to have a fair and equitable share of the Nile and more and more dams to continue be built in Ethiopia - both for Irrigation and power. live with it!